Joseph S. Brumett III, was born November 2, 1968, In Danville, Illinois. He served an LDS Church mission to Sacramento, California. Joey always wanted to be a police officer. He joined the Utah Highway Patrol in March 1992. After graduation from the police academy, Trooper Brumett was assigned to Salt Lake County. 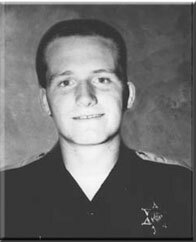 On December 11, 1992, Trooper Brumett was dispatched to a multiple vehicle accident, on I-15 at 2800 South. During the investigation, Trooper Brumett was assisting in retrieving a trailer tire from the center divider of the freeway. Trooper Brumett was struck by a pickup truck. The driver then struck another vehicle, before fleeing the scene on foot. The suspect was later apprehended and convicted of hit and run and driving without a license. Joey was survived by his wife of 16 months, Jennifer.